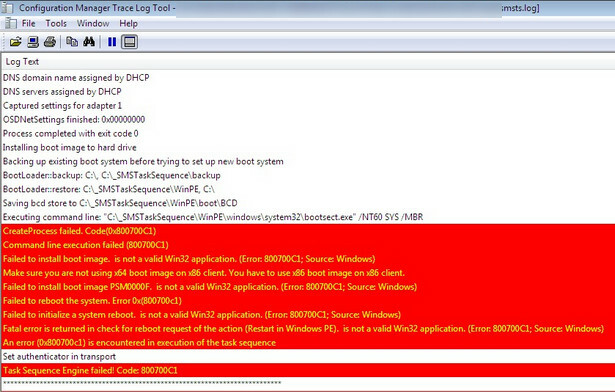 So a while back I implemented a working Windows XP to Windows 7 refresh using Configuration Manger 2012 R2, some of you may be aware that this was an issue initially as there was a bug with the client being unable to stage the boot image just prior to the initial restart into WinPE. To address this a hotfix was released however the whole process had a lot of caveats to it working and was generally painful to implement. Good news, nothing has changed with that! 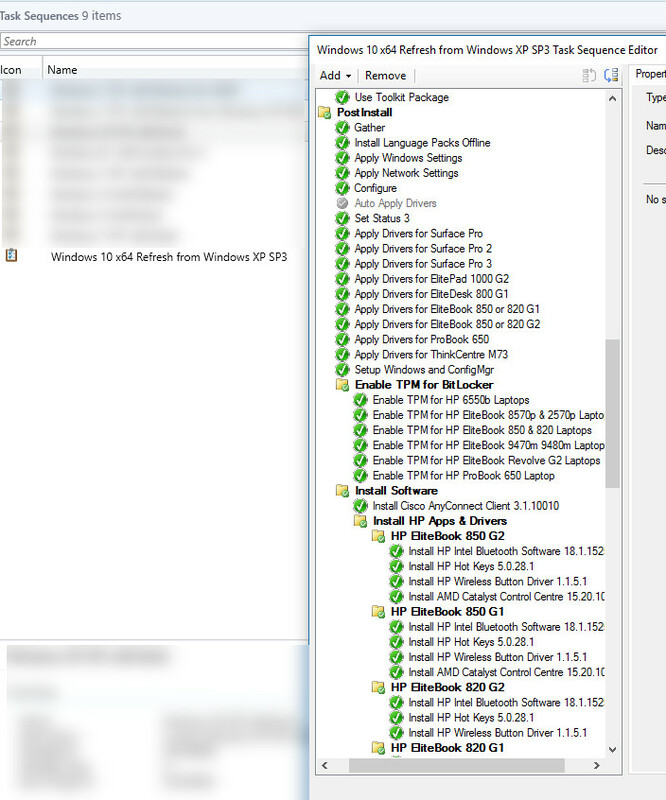 So last week I was thinking maybe my existing process can be used to achieve a Windows XP to Windows 10 refresh, surely that’s possible assuming that the original change Microsoft made in the client to support staging a Windows PE 3.1 boot image had been retained in the latest Configuration Manager 2012 R2 SP1 client? 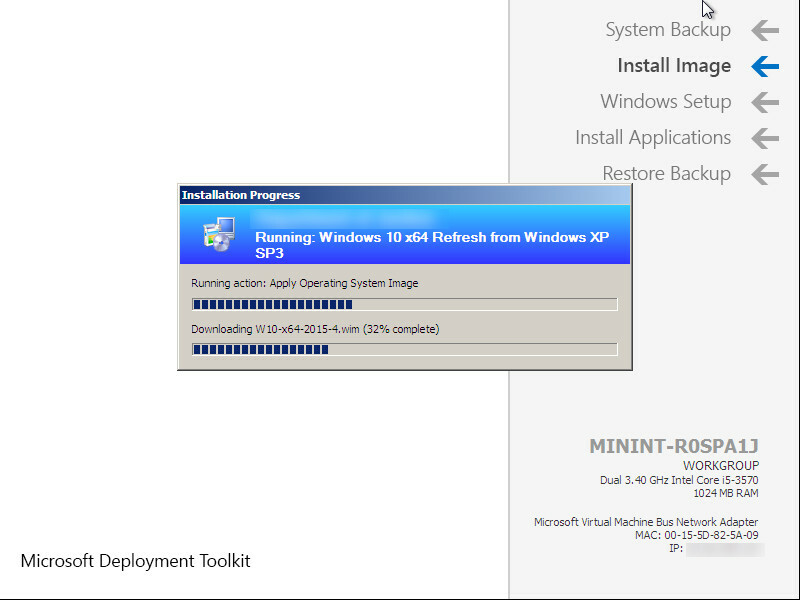 Well I’m happy to report that with a few changes this is indeed possible, although totally unsupported my Microsoft! So with that out of the way how do we go about this? 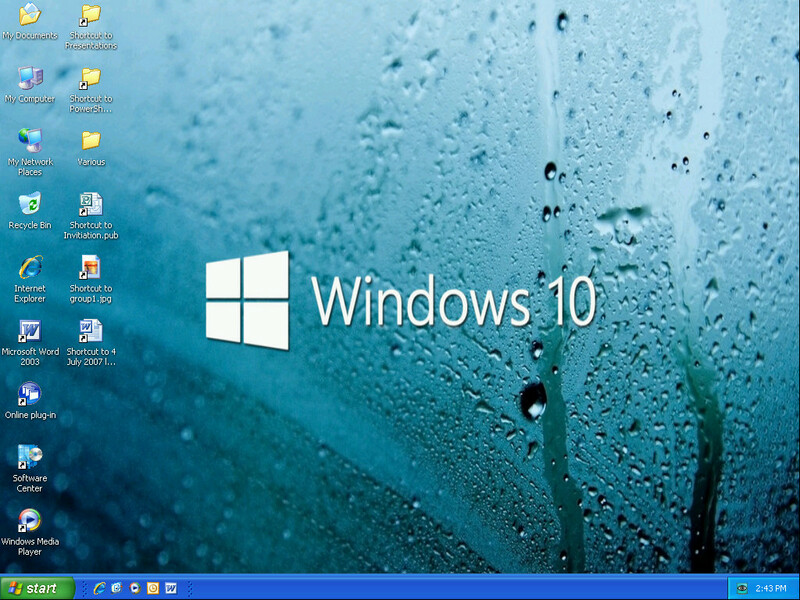 Well the main problem with trying to do this is the issue of staging the boot image to Windows XP – so make sure that you have a Windows PE 3.1 boot image and that you have a Configuration Manager client on your Windows XP OS that is 5.00.8239.1203 or higher. If you get this wrong, you will see an error in the logs relating to an inability to stage the image as per the below screen grab. The other main issue your likely to run into is a lack of drivers in your Windows PE 3.1 boot image, so spend some time making sure you have all of your hardware models NIC and storage drivers added to the boot image that are required. A few assumptions are going to be made by me here. 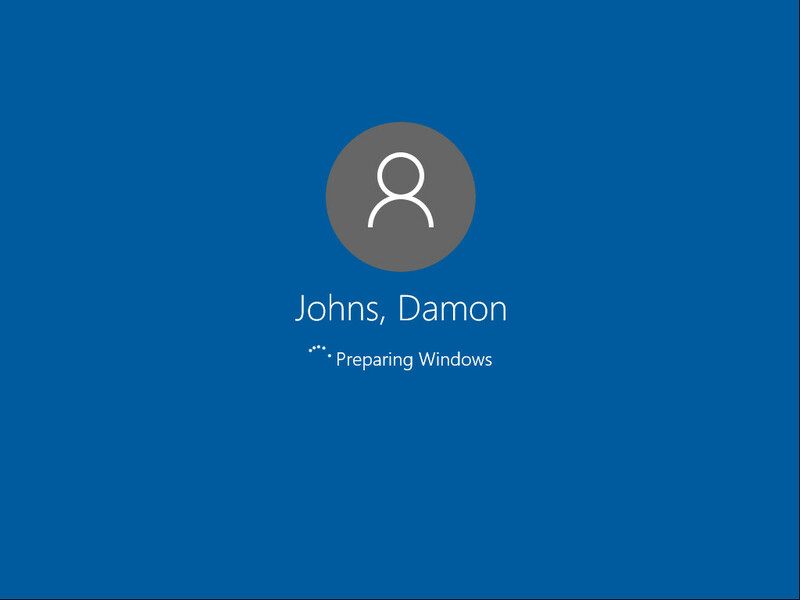 You have a working custom Windows PE 3.1 x86 boot image with your hardware model network and storage drivers injected into it – follow this guide for building your own boot image. You can use DISM to inject drivers in a mounted wim file with this documentation. Remember that you will need to inject the correct driver versions relevant to the PE 3.1 boot image, in most cases this will be the Windows XP equivalent for each of your hardware model types. Create your USMT 4 package and distribute the package to your Distribution Points. 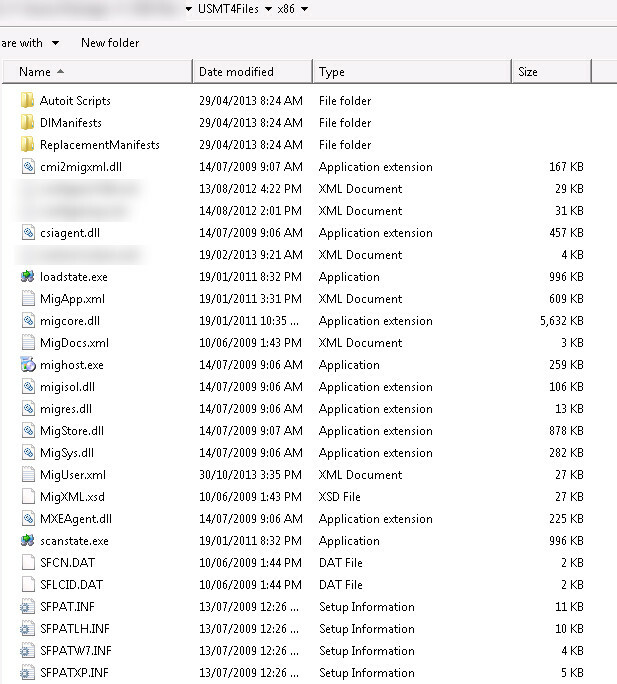 As mentioned previously the source files can be obtained from the Windows AIK. 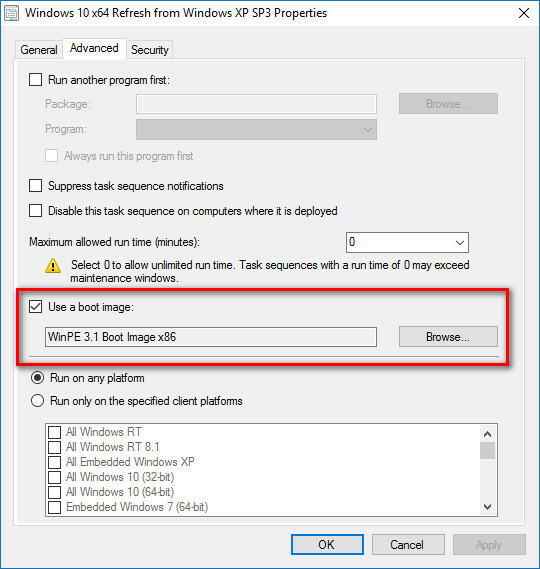 Create a new MDT Client Replace Task Sequence specifying your Win PE 3.1 boot image, MDT Files package, Windows 10 OS reference image, Client package, USMT 10 package and your Settings Package. 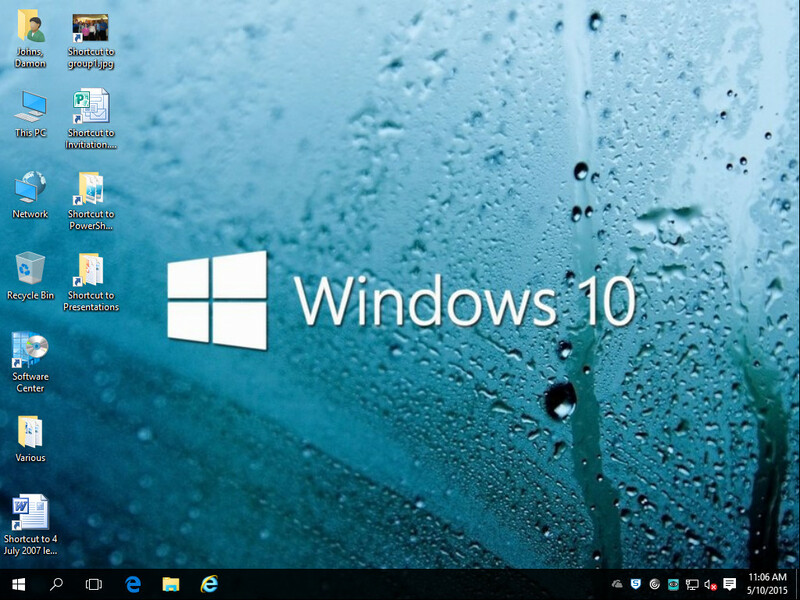 Make sure that you add any driver packages, applications and other settings for your Windows 10 OS such as Start Menu Layout file import steps, etc. Also don’t forget to set a local administrator password, time zone and any other Task Sequence specific settings that need to be addressed. 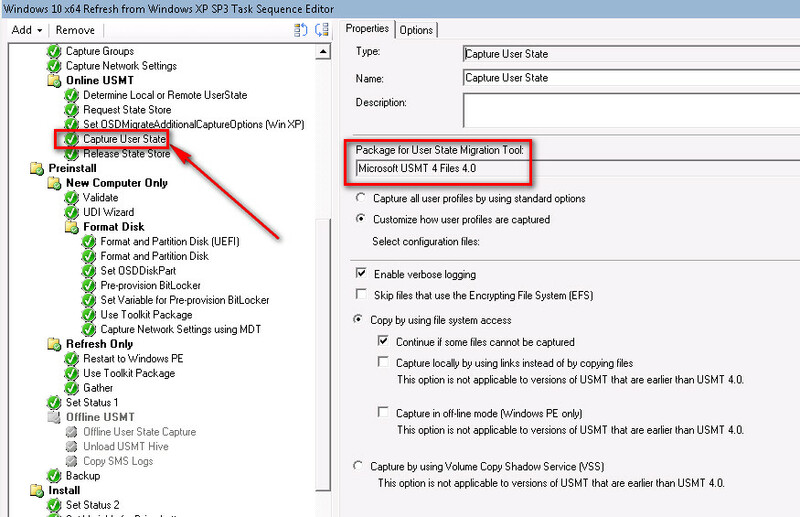 Edit the newly created Task Sequence so that the Capture User State step runs your USMT 4 package. Even though Microsoft have documented that USMT 10 supports capturing files and settings from Windows XP, it fails with an execution error about scanstate.exe not being a valid Win32 Application. Note that you could use USMT 5.0 however I already had a working USMT 4.0 Files package so for this blog I have chosen to leave the version at this level. You can leave the Restore User State step as USMT 10 as it will restore the data from the Capture User State step. Create a new collection for deployment and review your Task Sequence. 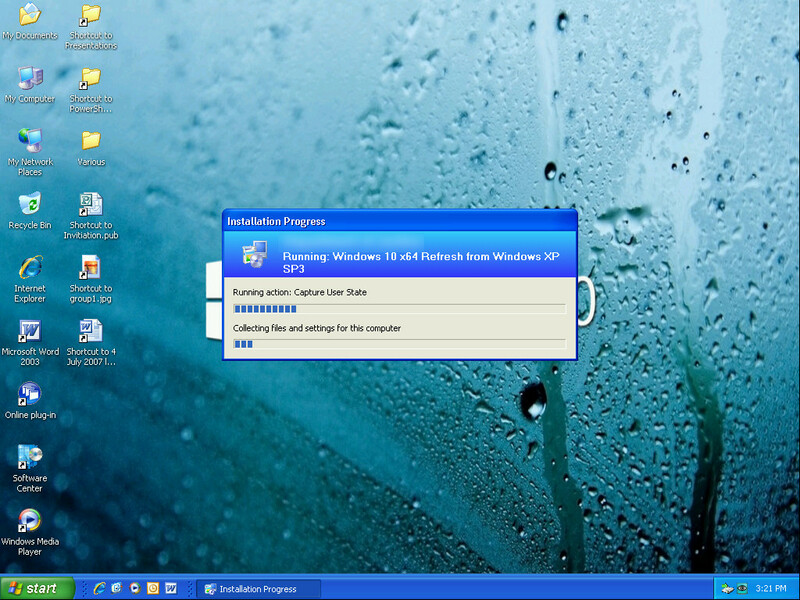 Check that your Windows XP client is running the correct Configuration Manager client version of 5.00.8239.1203 or higher and add your Windows XP client to the collection. Review your results. 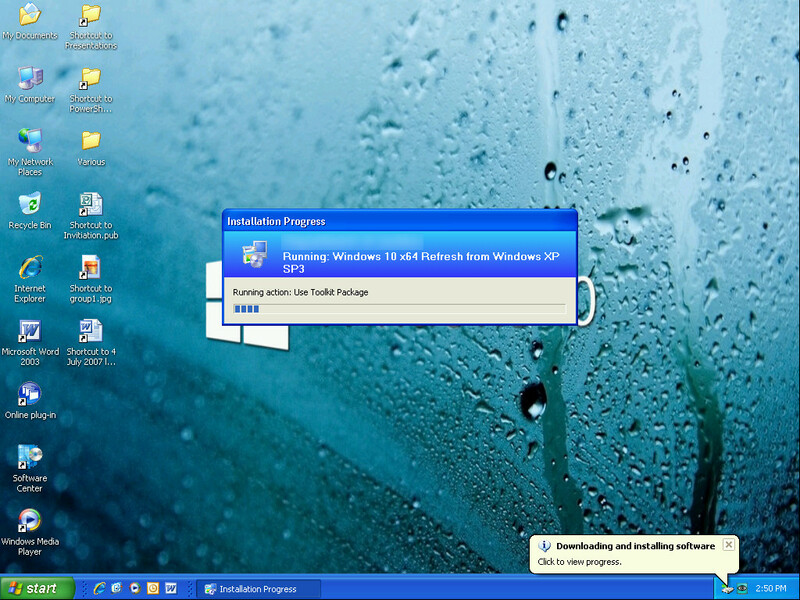 Its worth mentioning that the User State Migration Process doesn’t restore the wallpaper settings between Windows XP and Windows 10 and I don’t believe this is possible. However I’m happy to be corrected on this one if anyone does manage to achieve this. It does however migrate the source jpg and I’ve just reset this as the background image.